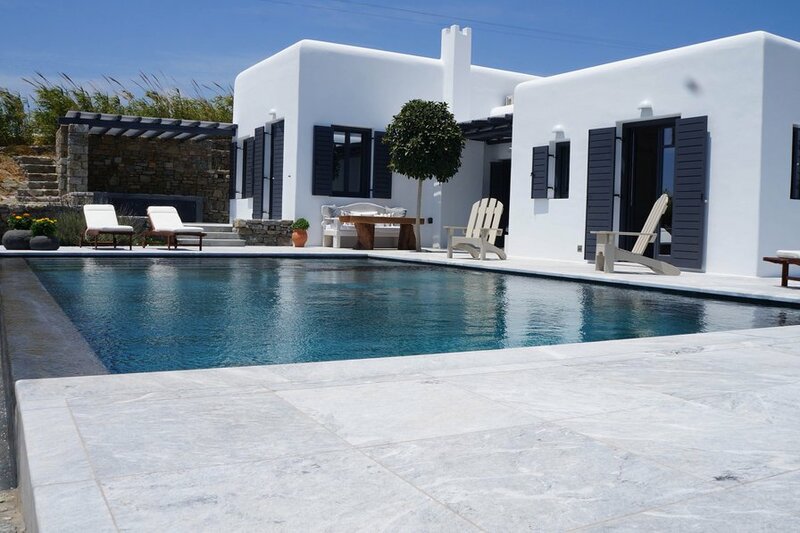 Recently built with high standard requirements, our modern designed villa is located near Kalafatis bay, one of the most beautiful and quiet beaches of Mykonos Island, only 9 km away from the Town centre. Its architecture is minimal emphasising the outdoor space. The interior is cosy and decorated with pristine, and tastefully appointed, comfortable furniture and artwork. The large windows, allow plenty of light to come in every room and offer a unique view no matter in which room of the Villas you are. On the same floor are located a fully equipped kitchen, dining area and a spacious living room with a couch for 8 persons and fireplace, two bedrooms with comfortable queen beds, a bathroom and a guest WC. Rooms are comfortably spacious and tastefully furnished in a bright, minimalist style, incorporating white walls and ceilings with traditional features of Cycladic architecture, making this Villa a top choice for those who seek the best from traditional and modern design. There is an infinity pool of 8 x 4m separating the outdoor area into 3 smaller ones. On the one side of the pool is the first lounge area with 2 sun beds. On the other side of the pool there is the second lounge area with 2 more sun beds. In the third area there is an outdoor dining table for 6 people and a sofa. Kalafatis is a beautiful, long sweeping bay with white sandy beaches spreading out on either side of a narrow rocky headland. Clear waters make Kalafatis an ideal choice for fine swimming, offering the option to catch a boat for Dragonisi an islet off the east coast which has many caves, some of which are said to be populated by the rare monk seal. Being one of the earliest established beaches, it is well known to wind surfers who enjoy a good offshore breeze. Apart from wind surfing, the visitor is able to enjoy various water sports including diving with access to the shore. Many small restaurants with reasonable prices can be found in the area often specializing in local seafood dishes. Our villa are less than 5 minutes away from the crystal clear waters of the Aegean Sea.